According to Wikipedia, cat cafe originated in Taiwan in 1998. The first cat cafe in Japan, was in Osaka in 2004. The concept blossomed in Japan from 2005. One of the reasons was the restriction of pets in Japan apartments. Cat cafes are everywhere now, not only in Japan. 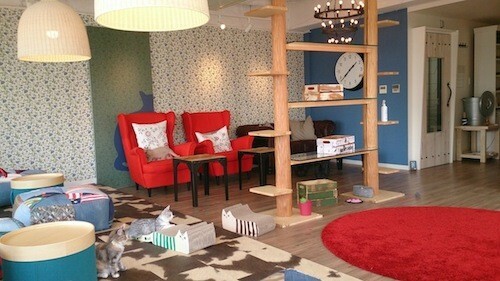 Personally, I think it is very relaxing to be in the cat cafe. Cats relieve my stress. Cat cafe was one of the places I wanted to visit in Japan and I did. I was in Asakusa and had 2 hours to spare before meeting my husband. Googled for nearby cat cafe and found Neko Cafe Monta. Took me a while before I found it. I spent an hour at the cafe and time passed so fast. This is the concept of the cafe. Big, open space where cats roam freely. A book is provided for the visitors, introduction of all the cats. The cats were really active. Enjoyed playing with them. One of them even posed for my camera. What I can say is, even Japanese cats are polite. This little kitten, Azuki was so adorable. She just came over and sat with me! I was so touched. The best part, when I was making the payment and about to leave, Azuki walked over to bid goodbye. I am just amazed how elegant and poise cats can be. Go visit cat cafe if you are in Japan. Very well behaved cats. Charges ¥1,000 an hour (excluding tax), about SGD12. Asakusa Station, 1 minute walk. Go look for Starbucks. Then look out for Yoshinoya signboard.